When it comes to routine maintenance, roller chain is one of the most neglected system components due to its inexpensive cost value. Because they are commonly covered by guards, too, they often fall ‘out-of-sight, out-of-mind,’ only becoming a priority once the chain starts acting up and making noise. However, proper roller chain maintenance might be more important than you think. “Roller chain is a key component to a bigger system and can end up costing you a lot of downtime down the road if you neglect it,” says Tim Zerger, IBT Director of Bearings and Power Transmission. 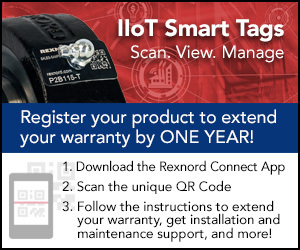 Learning how to identify, measure and prevent the common wear-and-tear in even the smallest, most inexpensive parts of your systems can help keep your operations running smoothly, longer. Luckily, there’s an easy solution to measure whether or not your chain has worn, or your chain has ‘stretched,’ without removing the chain from the sprockets. Timken Drives offers an EZ Chain Wear Gauge that measures the distance between two roller links, in-place, by dropping it down between them. Locate the corresponding step on the gauge. 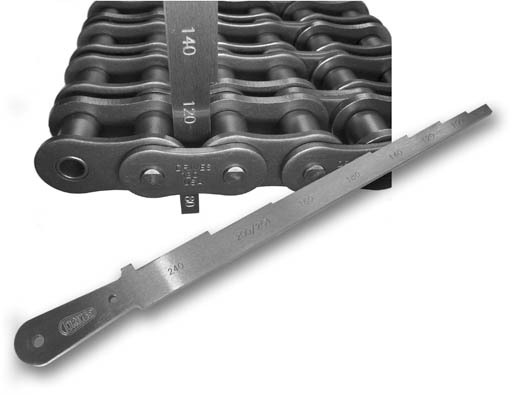 Made from tough steel, this gauge accurately checks up to nine sizes of American Standard roller chains. “It’s my number one recommendation for chain stretch measurement because it’s easy to use and you can’t mess it up. It either goes or it doesn’t,” Zerger says. When a chain gets rained on, dirty or dusty, the lubrication barrier will quickly diminish if not reapplied regularly. “If you’re not paying attention to your chain━how it’s wearing, how it’s stretching and how it’s lubricated━you’re damaging both your chain and your sprockets,” says Zerger. Mechanical Power Transmission has been a cornerstone of the IBT Industrial Solutions business since the company was founded in 1949. If you’re looking for the knowledge and expertise you need to keep your applications up-and-running, contact Tim Zerger, the Bearing and PT Business Group Director at IBT Industrial Solutions, or give us a call at 913-677-3151 to learn more.